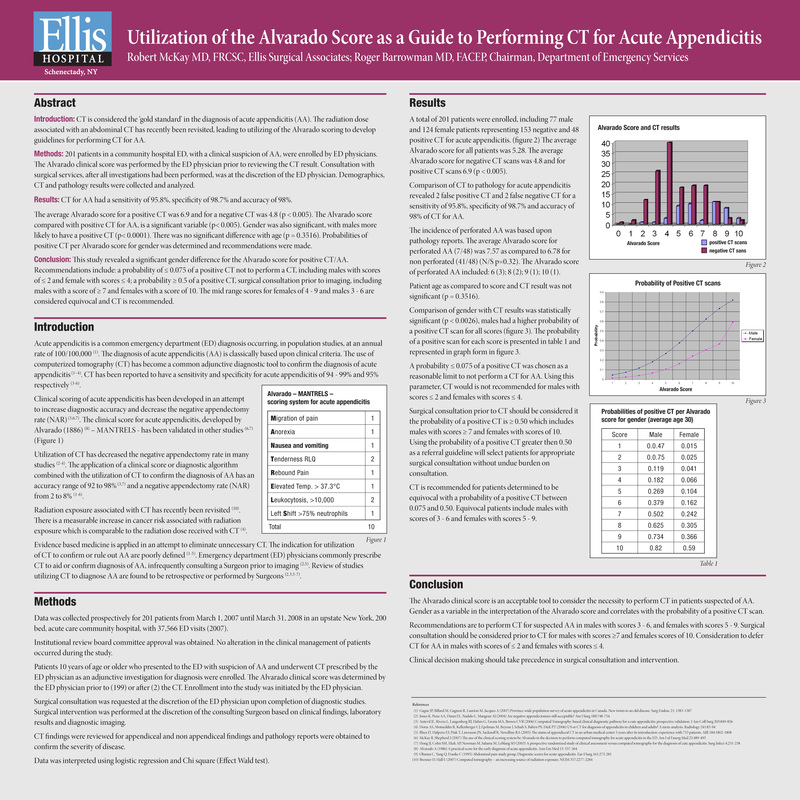 Use of Alvarado Clinical Score for Acute Appendicitis to Direct Utilization of CT for Acute Appendicitis. Introduction: CT is considered the ‘gold standard’ in the diagnosis of acute appendicitis (AA). The radiation dose associated with an abdominal CT has recently been revisited, leading to a reassessment of indications to perform CT for AA. The Alvarado score for AA, determined prior to CT, is compared to CT and pathology results and recommendations are made on the utilization of CT for AA. Over a 12 month period, 201 patients (77 males, 124 female) in a community hospital ED, with a clinical suspicion of AA, were enrolled by ED physicians. The Alvarado clinical score was performed by the ED physician prior to reviewing the CT result. Consultation with surgical services, after all investigations had been performed, was at the discretion of the ED physician. Demographics, CT and pathology results were collected and analyzed. CT for AA had a sensitivity of 95.8%, specificity of 98.7% and accuracy of 98%. The average Alvarado score for a positive CT was 6.9 and for a negative CT was 4.8 (p < 0.005). The Alvarado score, compared with positive CT for AA, is a significant variable (p< 0.005). Gender was also significant, with males more likely to have a positive CT (p< 0.0001). There was no significant difference with age (p = 0.3516). This study revealed a significant gender difference for the Alvarado score for AA, with the endpoint of a positive CT. Recommendations for the utilization of CT in the diagnosis of AA, include: a probability of under 0.075 of a positive CT for AA as an acceptable level not to perform a CT, including males with scores of 2 or less and female with scores of 4 or less; a probability over 0.5 of a positive CT, surgical consultation prior to imaging, including males with a score of 7 or greater and females with a score of 10. The mid range scores of 4 through 9 for females and 3 through 6 for males are considered equivocal and CT is recommended.